Department of Sociology, Women’s and Gender Studies, Acadia University Faculty Association Women’s Committee invites you to celebrate, International Women’s Day. 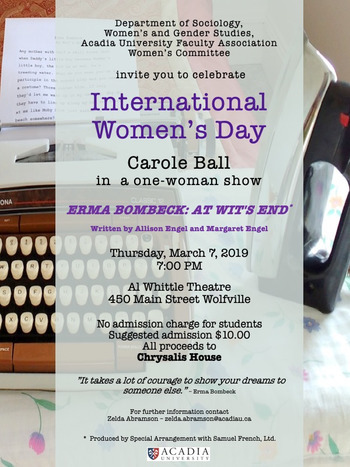 Carole Ball will be performing as ERMA BOMBECK in a one woman show. All proceeds to Chrysalis House. No admission charge for students. Suggested admission $10.